Pipe bands were a feature of the parade. 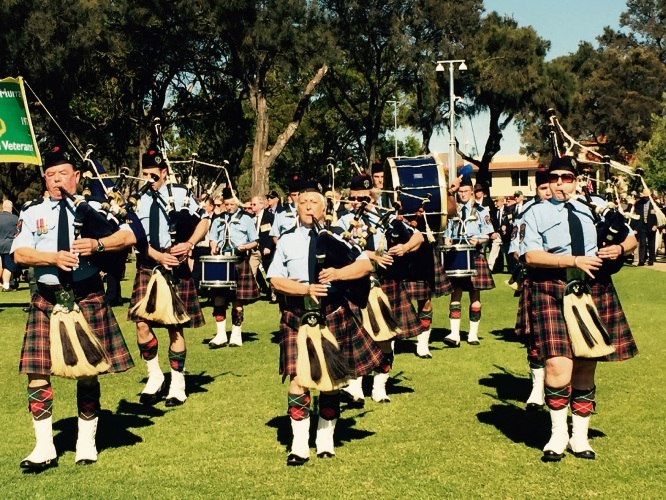 MANDURAH turned out in increasing numbers on a perfect autumn day for the Anzac Day service at Mandurah War Memorial. Guests speaker Canning MHR and retired Army captain Andrew Hastie said war was a terrible thing. He said 60,000 died in four years during World War I – “a whole generation simply disappeared”. 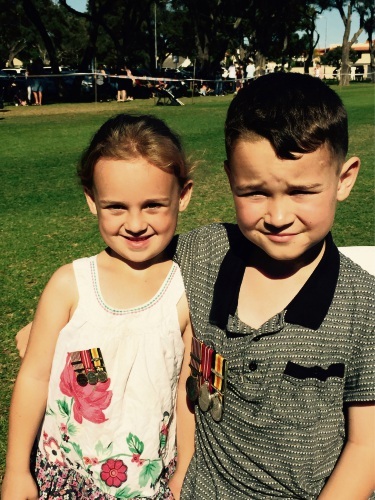 Aneisha (5) and Ethan Holland (8) proudly wore their great grandfather’s medals. “People from all walks of life were struck down in the prime of life,” he said. “Many have asked what it achieved and that the deaths were meaningless. “But the Anzacs offered courage, endurance, daring and mateship and courage that we can only imagine. On display and later cut at the fellowship gathering at Mandurah Bowling and Recreation Club, was a cake in the shape of the Australian National Memorial at Villers-Brettoneux, created by Kaylene O’Donnell.